We have put together a list of party planning resources to help you celebrate your First Communion! Feel free to call or email CommunionCards.net customer service team if you need any help with creating your Communion invitations or planning your party. Celebrate in style with us! 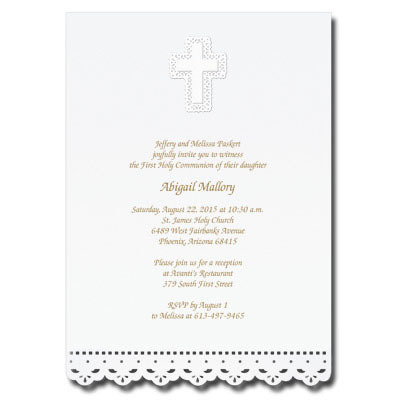 Our stylish Communion invitation cards come in modern, classic, and elegant styles. Enjoy the best product selection online - featuring premium, handmade invitations with layered vellum, lace cut borders, and deckled edge embellishments. We also offer crosses, custom photo and picture templates, charms, bows, ribbons and diamond accessories for an added touch of elegance. 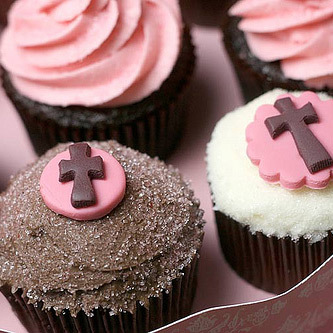 Our Communion accessories can also be used for Confirmation! Celebrate the Eucharist and your faith with traditional party supplies from a world class designer and printer of First Communion stationery. We are glad to help you pick the proper wording, prayers, bible verses or etiquette guidelines for your invites, free of charge - call customer service for more details. 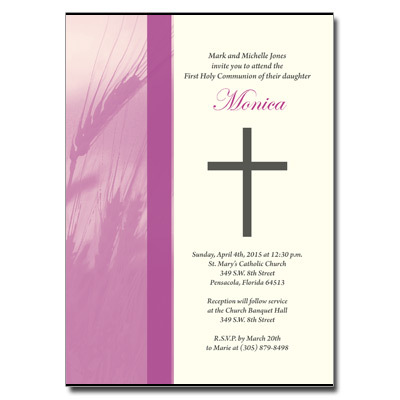 Thanks for choosing CommunionCards.net for your First Holy Communion Invitations!